"Don't be stupid. Think again." Strand Releasing has debuted the official US trailer for a Chinese animated film that is one of the craziest things you'll see all year. 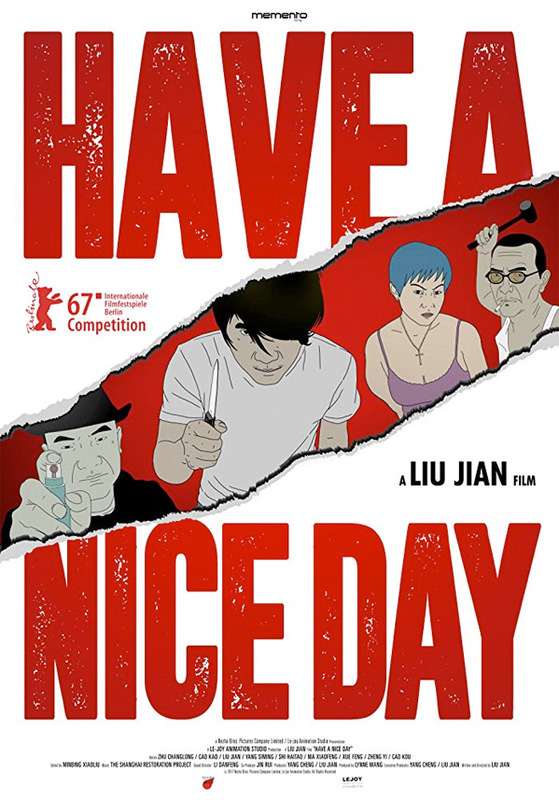 Have A Nice Day is a violent, brutal animated film from China, made by writer/director Jian Liu, that can pretty much be described as a Tarantino movie. One description says it's a "whirlwind neo-noir" about a bag containing a million yuan that draws various people from shady backgrounds into a bloody conflict. The voice cast includes Xiao Zhang, Lao Zhao, and Fang Yuanjun. This premiered at Berlinale, where I first saw it, and wrote in my review: "As light entertainment, it's a good film worthy of your time to discover," but "as political commentary, it doesn't have much to say." A hard rain is about to fall on a small town in Southern China. In a desperate attempt to find money to save his fiancée’s failed plastic surgery, Xiao Zhang, a mere driver, steals a bag containing 1 million from his boss. News of the robbery spreads fast within the town and, over the course of one night, everyone starts looking for Xiao Zhang and his money… Have A Nice Day is both written and directed by Chinese filmmaker Jian Liu, of the animated film Piercing I previously. This initially premiered at the Berlin Film Festival this year (read our review), and also went on to play at the Seattle, Fantasia, London, Busan, and Stockholm Film Festivals. Strand Releasing will debut Jian Liu's Have A Nice Day in select theaters starting January 26th, 2018 early next year. What do you make of this madness? Anyone want to see this movie?